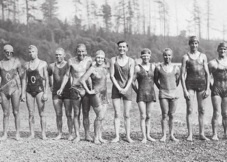 In 1926, the first organized competitive swim between Vashon Island and Point Defiance in Tacoma, WA was held across approximately two miles of open water, following the ferry route used today. Now we are making it possible to repeat this historic feat! 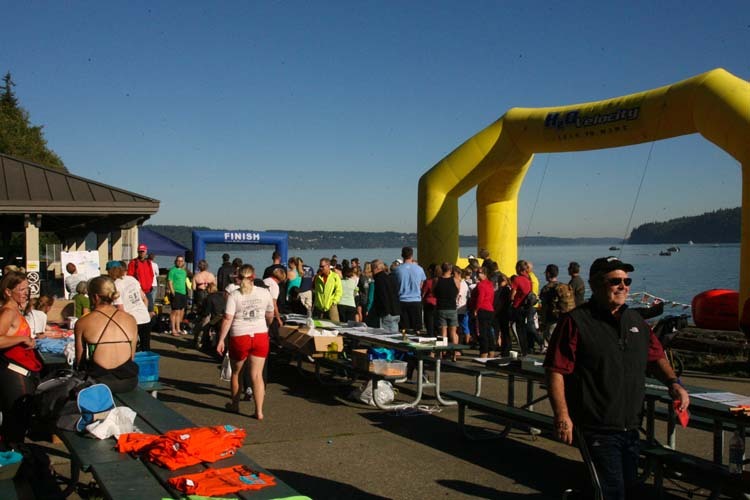 Blue Wave Aquatics is proud to announce the 6th annual Swim Defiance taking place at Commencement Bay, in Tacoma, Washington. We welcome back returning swimmers as well as everyone else planning to participate in July for the first time. We will repeat the Julie Montiel Friends and Family wave allowing fins, hand paddles, pull buoys or another desired swim aides. Ankle chips will also be required to track swimmers in and out of the water. Cold water training for Swim Defiance is FREE for current BWAQ members, swimmers with a USMS membership (please contact Zena before coming to the training) and swimmers who have registered for Swim Defiance. 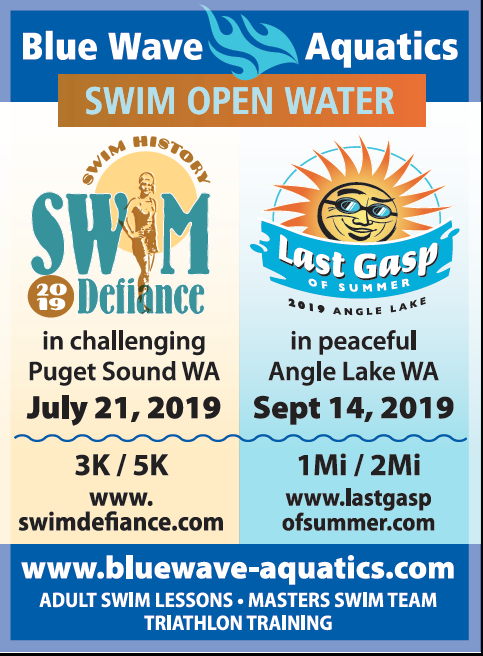 If you are planning to attend confirm with Zena; in person, by email swimdefiance@bluewave-aquatics.com, OR phone 206-651-0823 so we don't start the swim without you. 10 Practice swims for the 2019 season will start June 13th and conclude July 16th. We reserve the right to change course / location due to conflicting events, tide and snags that can alter the course / location. Our practice swims offer an opportunity to swim with others, on a pre-approved safe course, at various Puget Sound beaches. Water temperature in the Puget Sound varies over the season from about 54℉ at the start of June up to a high of 59℉ near the end of August. Upwellings of colder water around the course can be refreshing on a hot day, but we do advise wearing a wetsuit both for warmth and floatation. You should be comfortable swimming 1200 yards (48 lengths in a 25 yd pool) / 1000 meters (40 lengths in a 25m pool) and have all the recommended safety items. Change rooms, washrooms, no showers, concession stand, FREE parking lot. We do not always have a volunteer to watch your gear while you swim, so prepare to leave valuables in your vehicle or lock them with your bicycle on the beach. Zena will have a dry bag to hold car keys safe but there may be a lag to retrieve keys for faster swimmers as Zena will need to remain with the slowest swimmer thru the end of the swim. Struggling with open water swimming or feeling out of your depth? Check out our Blue Wave Aquatics programs to get your skills and improve your open water confidence. Click here for more information. Don't have a wetsuit? We have a couple options! A great place to rent or purchase a wetsuit is Northwest Tri and Bike. They are located at 15423 SE 272nd St, #107 Kent, WA 98042, 253-638-BIKE(2453). They also carry a wide selection of goggles, wetsuits and other swimming accessories, as well as triathlon products. Please mention you heard of them through Swim Defiance or Blue Wave Aquatics. Or we have partnered with XTERRA Wetsuits to bring you some killer discounts! Click on the logo below to see the deals and then sign up on our Facebook page to get the discount code. Swim safety buoys are MANDATORY for this race. More information about the Swim safety buoys is available on the SAFETY page. 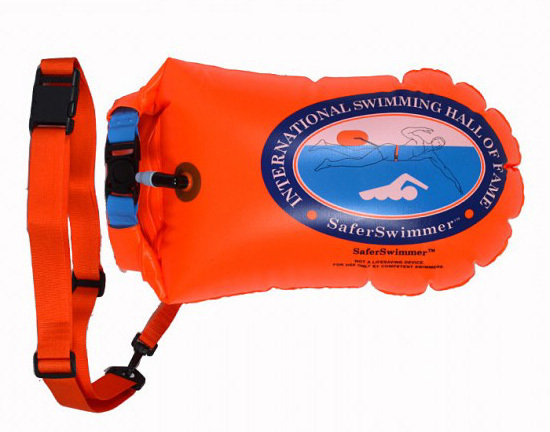 Swim Buoys are available for purchase when you register. $36.00 / medium or $39.00 / large. They are also available at SwimOutlet.com by clicking the image below.